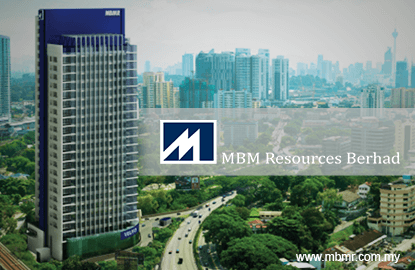 KUALA LUMPUR (Aug 19): Lower sales from both motor trading and auto parts manufacturing dragged MBM Resources Bhd’s net profit down 6.5% to RM29.22 million or 7.48 sen per share in the second quarter ended June 30, 2015 (2QFY15) from RM31.24 million or 8 sen a share last year. The decline in demand was in line with lower total industry volume and total industry production, it said in its filing to Bursa Malaysia today. Similarly, revenue for 2QFY15 declined 23.9% to RM374.41 million against RM492.17 million. It also declared an interim dividend of 4 sen per share and a special dividend of 3 sen per share under the single-tier system in respect of the financial year ending Dec 31, 2015. Meanwhile, for the six months ended June 30 (1HFY15), net profit came in higher at RM64.37 million from RM54.67 million a year ago, up by 17.8%. Cumulative revenue also grew 2.8% to RM966.15 million from RM939.53 million in 1HFY14. MBM (fundamental: 1.8; valuation: 2.0) said overall decline in profit before tax was mainly dragged by lower sales from both motor trading and auto parts manufacturing, in line with lower total industry volume (TIV) and total industry production (TIP). It said motor trading division performance was affected by slow demand after the implementation of the goods and services tax (GST), though these were cushioned by recovering demand, albeit at a low rate in May and June, helped by Volkswagen sales, and better aftersales revenues. Its auto parts manufacturing saw lower revenue due to lower demand by major car makers; profits were also affected by the weakening of the ringgit. Share of joint venture's results declined 21.3%, though associates' results improved 11.6% on higher sales of Perodua vehicles and lower losses from Hino Motors Manufacturing. Looking forward, the group said uncertain economic conditions will continue to affect consumer sentiment, while the weakness of the ringgit will result in higher operating costs for the group. Hence, it will continue focusing on cost management and improving its aftersales revenues, while growing its market share from new models and leveraging on sales campaigns by brand principals. Shares in MBM closed unchanged at RM3.09 for a market capitalisation of RM1.21 billion.